Amir Hanis Cantabile: How To Blog Via Mobile Phone? Okay, actually blog using Sony Ericsson phone is different compared to other model of phone. 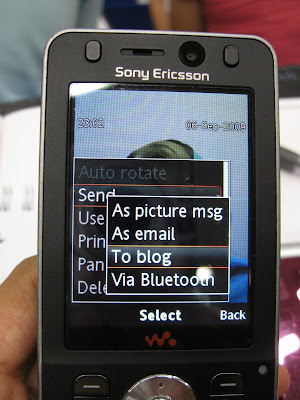 I can say it more convenient because Sony Ericsson phone has build in Blogger option. 1) Of cause you need to take a picture. 3) You will see something like this and you can blog as usual. 4) After publish the post, you will receive a sms from blogger like below. Yes it will publish in new blog. But if you already had blog and want to publish to your old blog, not the new one, follow step 5. 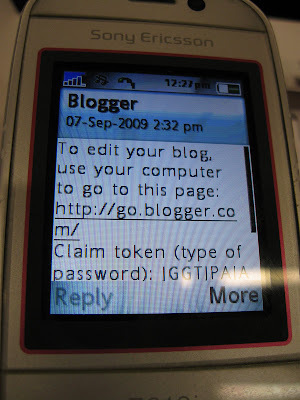 5) Go to http://go.blogger.com > Enter the claim token that you receive by email. Then, continue. 6) You will be asked to delete the blog or continue. Click continue and you will be asked once more to combine the new blog with your old blog. But remember to login to your google acount before using this, so that they can auto detect your blog. 7) You can continue editing and next time you blog via phone, it will publish in your old blog. * First send an MMS or email with the word 'REGISTER' to go@blogger.com. * We'll reply with the address of your new mobile blog, plus a claim code. * Post to your new mobile blog, or use the claim code to link your phone to a different blog. * To unlink your device from Blogger, send an MMS or email with word 'UNREGISTER' to go@blogger.com. But SMS to BLOGGR only available in US. There are pros and cons if blogging via phone. tekan je nick aku. selama ni aku post guna K770i aku je. x reti nk post dlm blogger pon~ tp honeyz lupa mention kene bayar sket sen la klu nak post. da r kene rate Youth Club. OK la.